The word ‘Drishti’ means sight in Sanskrit. A natural or casual look at anything is harmless. But it is believed that the shafts of sight tinged with the element of jealousy have the power of destroying the thing or the person which they strike. From ancient times it is known that a mother fondly applies a black dot on the cheek of her baby with a view to ward off the influence of any evil-eye. Traditional rituals like throwing away a lemon after waving it before the baby a number of times, in order to protect him or her from such baneful influence. Then their is a practice of shopkeepers burning camphor and breaking coconut before their shops on every Friday. People perfom Homas to ward of evil from their homes and lives. As every person’s life is in accordance with his thinking, “a man becomes what his thoughts make him to be “, say the psychologists. Therefore, the only way to solve the problems of the modern man is by channelising his thought in the right direction. That alone can do him good which in turn will enable him to lead a happy life. Therefore, in the first place, man should change his thoughts for the better. He should replace evil thoughts with good ones. 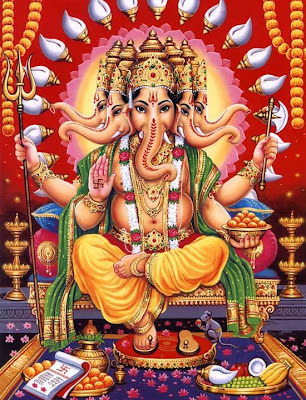 Shuba Drishti Ganapathy is an all-powerful glorious divine form brought into being with the unique, powerful blessings of Sage Agastya, the foremost among the eighteen Siddhas. 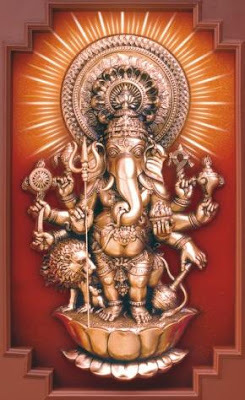 Lord Vinayaka has the power to bring about thought transformation ( from bad thoughts to good thoughts) That is why, gathering within Himself all divine powers, He, as Lord Ganapathy, has descended on this earth, as Sri Shuba Drishti Ganapathy. 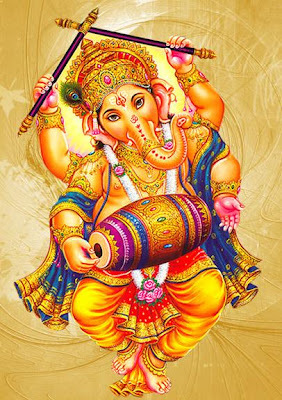 Sri Shuba Drishti Ganapathy is the 33 form of Ganesha in this Kali Yuga who has risen for the good of the people, taking this supremely attractive form. 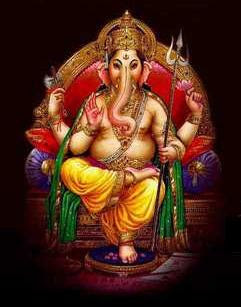 Mahaganapathi in this rare form is the confluence of several incarnations of the Supreme, al rolled into one. Seated on the lion and holding the Triden in His hand, He symbolises Devi Parashakti. He with Agni in one hand and the Third Eye on His forehead reveals that He is none else than Lord Siva. He reminds us that He is an ‘amsa’ of Goddess Mahalakshmi, standing as He does on the lotus. He dispels poverty and bestows prosperity on his devotees. Holding Sanku, Chakra and Gatha, He appears as the very form of Lord Vishnu, assuring protection to the meek and weak. Amritha Kalasa on His crown connotes Lord Dhanvanthri, the dispeller of diseases. The circular radiance round his profound head reminds one of the Goddess Gayathri, giver of all desires. The Mahakundalini, Goddess Thiripurasundari, who could be discerned in His form, is sure to generate good thoughts in mind and lead one in the right path. 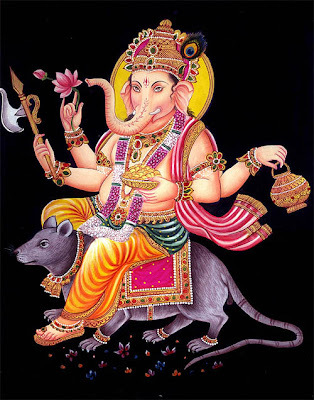 Lord Maha Ganapathy has reincarnated now as Sri Shuba Drishti Ganapathy. He removes the miseries or sorrows of all those who worship Him. Millions and millions of people are being blessed by Him with the prosperity. The cumulative effect of the vibrations caused in His worship not only benefits the worshippers but leads this world to peace and prosperity. Its a rare photo of Saraswatilakshmi. “WE need both knowledge and wealth to sustain the cosmos. Without knowledge We cannot plan. Without wealth We cannot implement a plan. Wealth sustains life; the arts give value to life. Thus both Lakshmi and Saraswati are needed to live a full life." A long time ago in ancient India , there lived King Ugrasen. He had two children, prince Kansa and princess Devaki. Prince Kansa was evil by nature. When Kansa grew up, he imprisoned his own father Ugrasen and made himself king. Each time Devaki gave birth to a child in the prison, Kansa arrived personally and killed the child. When Devaki became pregnant for the eighth time, King Vasudev’s friend’s (King Nanda’s) wife Yashoda was also pregnant. 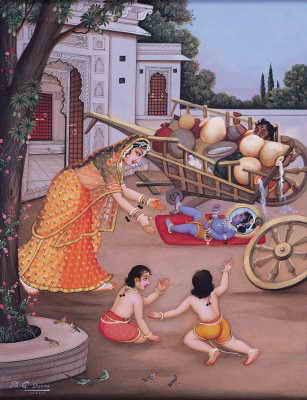 The eighth child, Lord Krishna, was born to queen Devaki at midnight in the prison. As soon as the child was born, Lord Vishnu appeared in divine form and the prison was filled with a dazzling light. Both Devaki and Vasudev prayed to Lord Vishnu. At the same time as Lord Krishna was born in the prison, the divine energy of Lord Vishnu was born in Gokul, as a baby girl to queen Yashoda. A divine message came to Vasudev soon after the birth of Lord Krishna, "Take this child across the Yamuna River to Gokul and exchange him with Yashoda’s daughter. You will return to the prison before anyone comes to know about the birth of this child." Vasudev immediately followed the advice. As he carried the child in his arms, he found that the prison doors opened automatically and the guards were put to sleep by God. 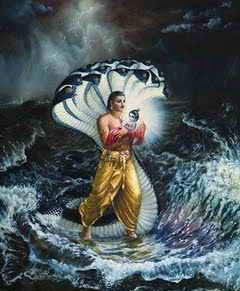 Vasudev approached the Yamuna River , which was very turbulent due to fierce winds and rain. However, as soon as Vasudev reached the riverbank, the river parted and made way for Vasudev carrying the divine child. 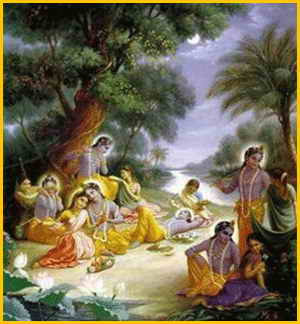 Vasudev reached the opposite bank of the river safely and found all the people of Gokul fast asleep. He entered the palace of king Nanda and queen Yashoda, and put the baby Krishna in the place of Yashoda’s baby girl. Then Vasudev returned to the prison with the baby girl. As soon as Vasudev laid the baby girl by Devaki’s side, the prison doors shut automatically. The guards were now awake and were startled by the cries of the baby girl. The guards ran to Kansa and announced the birth of the eighth child. Kansa rushed to execute the child in the prison, remembering the divine warning that the eighth child would kill him. Devaki appealed, "O Kansa, this baby is a girl, and not the boy that the divine warning told you about. How can this child harm you?" However, Kansa ignored her, snatched the child from her lap, and hurled the child against the prison wall. The child did not fall down; instead, she flew up and appeared in the sky as a Goddess with eight arms, each arm carrying a weapon. She said, "O evil king! You will gain nothing by killing me. The one who will destroy you is elsewhere." Then the Goddess disappeared. Kamsa was frightened. The inevitable seems to have happened in spite of all his efforts, What is he to do now? He consulted his ministers and they advised him that all male infants who were born in the last few weeks in his kingdom should be killed. Kamsa ordered his men to seek and kill all newborn male babies. 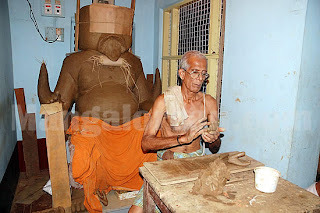 Soon, word reached him that a baby boy was born in Gokul a few days back. He sent the asura woman Pootana to seek him out and kill him. Pootana, the demon woman, knew that she could not kill the baby Krishna if his parents knew of her true identity. 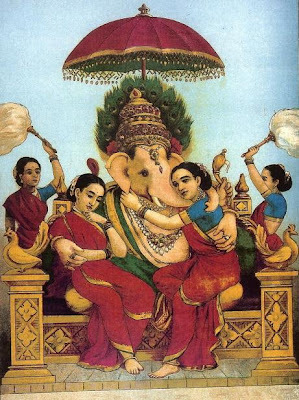 By means of her magic, the fiery looking Pootana transformed herself in to a beautiful motherly woman and entered Gokul. She carried poison in her breasts. She visited Yashoda’s house and seeing the baby Krishna sleeping in the bassinet, she admired Him so much that Yashoda thought that she was really a good woman fond of Krishna . Thus, when Pootana made a request to let her give Krishna her breast to feed Him, Yashoda was hesitant at first but yielded to Pootana’s insistent appeals to her motherly feelings. Pootana took the baby Krishna in to her lap and began feeding Him her poison. Krishna of course knew her tricks and her true identity. He sucked the poisoned milk out of her breast along with her life force itself. Pootana screamed in pain and lay dead immediately. Yashoda and her friends came out to see what had happened. To their horror they saw a great asura woman lying dead and Krishna playing on her body innocently. Pootana’s body was so big that Nanda and his neighbors had to cut it in to several pieces so they could carry and cremate them. Bakasura is again one of the asuras contracted by Kamsa to kill. Bakasura was the brother of Putana, whose story is given earlier. Bakasura took the form of a giant bird and terrorised the cowherds and cowherdesses of Gokul. 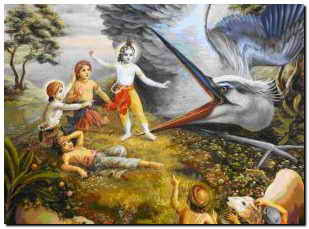 Krishna , in an act of bravery entered the beak of the bird, and then the bird closed its beak. But Krishna wriggled round and round inside so as to make Bakasura uneasy and ultimately Bakasura had to vomit Krishna out and he died on the spot. Similar to Bakasura, his brother Aghasura was similarly deputed by Kamsa. 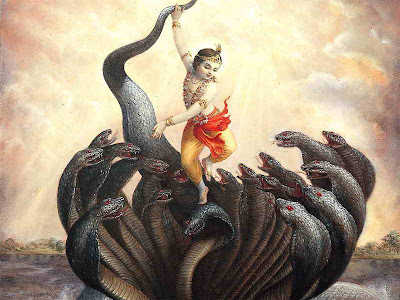 But Krishna again vanquished him too who took the form of a giant serpent, by going inside and wriggling his body. One day Yashoda was churning butter when Krishna wanted her to feed Him. Yashoda put aside the churning and sat down to feed Him. Just then she noticed the milk on the stove boiling over. So she sat Krishna down and rushed off to attend to the boiling milk. Krishna got angry for the interruption and He broke the butter pot and started eating the butter. When Yashoda noticed this, she became angry. Krishna noticing His mother’s anger started running out of the kitchen when Yashoda thought that He must be punished for His impatience. She followed Krishna , and after running around in circles for a while, she had gotten hold of Him. But she could not bring herself to give any kind of physical punishment to Him. So she tied Him to a heavy stone mortar so He will stay put for a while. Krishna however dragged the heavy mortar outside and right through the middle of two tall sala trees. 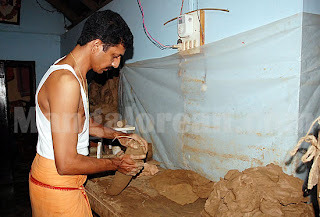 The mortar got lodged between the two trees but Krishna pulled on it so hard that the two trees fell down with a big noise. Everyone got alarmed by the noise of the falling trees and rushed to the scene. To their surprise, they saw Krishna unharmed and two gandharvas making obeisance to Him. They were Nalakubara and Manigriva, the sons of Kubera the guardian of money for the gods. 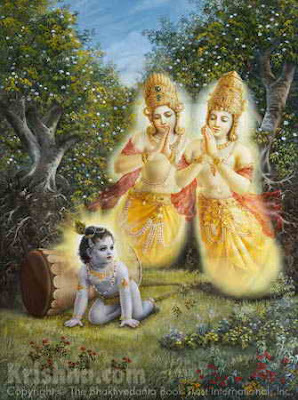 They had been cursed by Narada to be born as trees for insulting him. 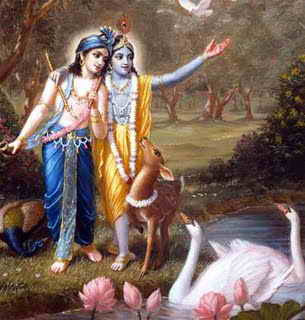 Narada later granted that they would be rescued by Krishna from their existence as trees. Now Krishna has fulfilled Narada’s promise to them. Undeterred, Kamsa sent several asuras to kill Krishna . The demons came in various forms: Trinavarta in the form of a tornado, Aghasura in the form of a giant serpent, Vatsasura in the form of a calf and many other asuras in many deceitful forms to kill the child Krishna but He killed them all to the wonder and amazement of the residents of Gokul. All the efforts of Kamsa to kill Him thus did not succeed and Krishna was growing up under the love and care of Yashoda and Nanda. But Yashoda could not see Him as anything but her lovable cuddly baby. His child-like behavior annoyed her at times but mostly she was greatly amused by his creativity for mischief. One day, his friends including Balarama told her that Krishna had been eating mud. She was angry with disgust at the thought of Him eating mud and dirt. So she pulled Him aside and confronted Him to tell her the truth if He had be en eating mud. Krishna replied, "Mother, why would I eat mud when there is so much butter and milk around? These kids just want to get me in trouble with you. Before you decide to punish me, why don’t you look in my mouth and even smell it to see if what they say is true?" So saying He opened His mouth wide so Yashoda could see inside of His mouth. Yashoda almost fainted with the sight. She saw the entire universe inside Krishna ’s mouth. The planets including the earth with all its life forms, the stars, the heaven and the entire creation was visible to her. She was bewildered and confused by that grand vision which was not possible for even the highest yogis. 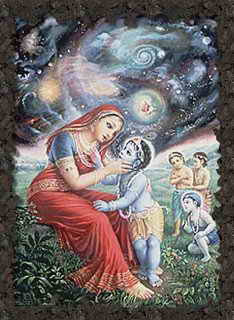 But soon Krishna became a child again and Yashoda recovered from Her vision. She forgot her line of thought and picked up Krishna and busied herself in coddling Him. As Krishna was growing up, He delighted His mother with many lovable mischievous acts. His favorite pastime was to steal butter from the neighbors’ houses who could not succeed in hiding it from him no matter how much they tried. When they tried to confront Him, He would disarm them with His charm. However, when He started to includ His friends in the mischief of distributing the milk and curds to monkeys, the women of Gokul could not keep quiet. They complained to His mother, Yashoda, about His mischief. In despair they told Yashoda that they can no longer tolerate His mischief and would rather leave the village than put up with it. Yashoda at first accused them of exaggerating but soon she pacified them by her reconciliatory apologetic words. She could not bring herself to punish Krishna , however. Krishna loved to tease the girls of Gokul, the Gopis. They all loved Him dearly because He also loved them much. In His infinite mercy, He wanted to make the Gopis realize the highest spiritual Truth through Him. That was possible only if they surrendered to Him completely. One day He got His chance when all the young ladies went swimming in Yamuna. They had taken their clothes off and entered the waters leaving the clothes on the bank. Krishna approached the site stealthily and took off with all their clothes and climbed up a nearby tree. When the Gopis realized that their clothes were gone, they looked up and saw Krishna up in the tree. They quickly sank in to the water up to their necks and pleaded with Krishna to return their saris and cholis but he would not heed. He told them that He would return their clothing only if they accepted him as the Supreme God and there was no place for false modesty before Him. The Gopis came out of the water one by one and accepted Krishna as their Saviour. A huge poisonous serpent with many hoods called Kaliya, made a lake in the river Yamuna its home. The lake and waters of Yamuna were being poisoned by it. The residents of Brindavan were very afraid of the serpent and avoided the lake altogether. Krishna decided that it was time to get the serpent out of the lake and restore it to the people of Brindavan. Once Krishna and herdboys were playing ball, and while playing Krishna climbed up the Kadamba tree and hung over the river bank, the ball fell into the river and Krishna jumped after it. Kāliyā rose up with his hundred and ten hoods vomiting poison and wrapped h imself around Krishna 's body. Krishna became so huge that Kāliyā had to release him. 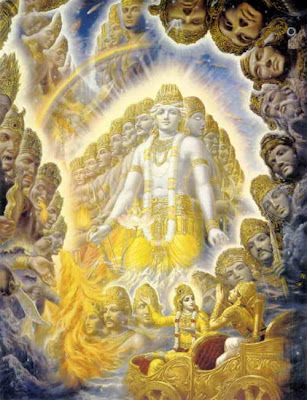 So Krishna saved himself from every attack, and when he saw the Brij folk were so much afraid he suddenly sprang into Kāliyā's head and assumed the weight of the whole universe, and danced on the naga's heads, beating time with his feet. Then Kāliyā began to die. But then the naga's wives came and prayed to Krishna with joined palms, worshipping Krishna and praying for their husband. Kāliyā, recognizing the greatness of Krishna , surrendered, promising he would not harass anybody. So Krishna pardoned him and then let him go free to leave the river and go to Ramanaka Dwipa. His friends saw this and ran back to the village to inform Yashoda and others. When they arrived, they saw Krishna being crushed by the serpent’s coils. They were all anxious and Yashoda started crying. Krishna could not see His mother cry so he decided to get Himself free from the serpent. He expanded Himself until the serpent could no longer hold him and lost its grip. Then Krishna jumped up on to the top of the serpent’s hoods and started dancing so hard that it could not bear the pain. Krishna danced on its hood for so long that the serpent fainted. One year there were no rains in Brindavan and the Gokul community was worried. 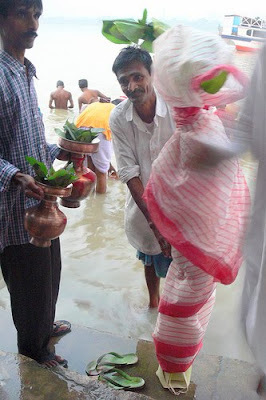 They started preparations to do a yajna (sacrifice) to appease the rain god Indra, the king of heaven. Krishna , however, did not want them to worship any demi god like Indra. He told them not to make the yajna in honor of Indra as He, the Supreme Lord, would take care of them. So the people of Brindavan did not perform the yajna which made the rain god Indra very angry. He sent a torrential rain with hail storm over Brindavan. It rained for several days and the storm was so fierce that all the inhabitants Brindavan were afraid for their cattle and lives. To protect them, Krishna lifted the Govardhana mountain with his little finger on His left hand and asked everyone to take shelter under it from the hail storm. 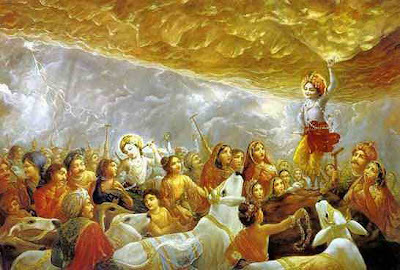 Indra rained hail for several days but could not harm them in any way because they were shielded by the mountain that Krishna had lifted on His finger. He realized that Krishna was indeed the Supreme God and apologized to Krishna who forgave him and sent him back to heaven. A grateful community of Brindavan praised Krishna as the Supreme Lord. It was spring in Brindavan. The flowers were blossoming. The autumn season was very pleasant on the banks of Yamuna whose sandy beach glistened in moon light. 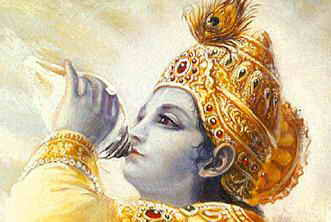 Krishna loved to play his flute and He was so good at it that even the animals and birds were mesmerized by its sound. 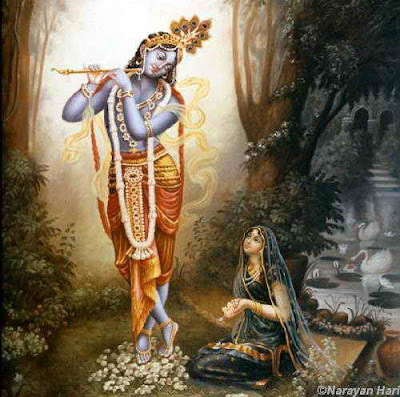 On one full moon night He started playing the flute which could be heard by the gopis in the Brindavan. The Gopis were so excited and enamored by the sound, that they forgot themselves and their families and ran to meet Krishna on the banks of Yamuna. Some were milking the cows but they left the milking undone and left. Some were making themselves up for the night and they left for Krishna half made-up. Some were feeding their husbands and families and they left them in the middle of their meal. Neither their husbands, nor their parents, nor their brothers, nor their in-laws could stop them from leaving their homes for the banks of Yamuna where Krishna played His flute. When they reached the shore of Yamuna , Krishna tried to send them back even though He knew fully well that there was no turning back for the Gopis. He told them that th ey should not come in the middle of the night to meet a stranger and that they should respect their husbands and parents. So the best thing for them to do was to return to their homes. The Gopis were very sad on hearing Krishna ’s words asking them to go back. They pleaded with Him to accept their love for Him. They told Him that they could not live without Him. So Krishna agreed to dance with them. He expanded Himself in to many Krishnas and made a circle such that each Gopi was surrounded by a Krishna and each Krishna was surrounded by a Gopi. In this circle, Krishna danced with all the Gopis on the banks of Yamuna. Then He lead them in to the water and sported with them on that moonlit night in the cool waters of Yamuna. Among the Gopis, was Radha, the childhood devotee of Krishna . Due to their eternal love, Lord Krishna is also popularly known as Radha-Krishna. Their love story symbolizes the love between God and Human. Radha, daughter of Vrishabhanu, was Krishna 's lover during that period of his life when he lived among the cowherds of Vrindavan. Si nce childhood they were close to each other - they played, they danced, they fought, they grew up together and wanted to be together forever, but the world pulled them apart. Radha, the milkmaid, was given in marriage to Rayana. But her heart belonged to Krishna , the divine cowherd of Gokul. On moonlit nights, beckoned by the music of his flute, she would leave her house, risk infamy, ignore danger, and go to the banks of Yamuna to be by Krishna 's side. Together they would dance and sing in the flowery meadows of Madhuvana. 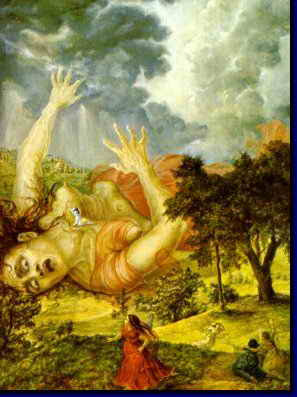 But alas, a time came when Krishna had to leave Madhuvana and go to Mathura to fulfil his destiny as guardian of earth. As he rode away, Krishna gave up his flute, for without Radha his music lacked the flavour of love.Krishna,it is said, conceived the cosmos inspired by Radha's beauty. Though united in heaven, Krishna and Radha were forever apart on earth, their longing transforming into man's insatiable desire. The constant desire to become one with the Divine. He departed to safeguard the virtues of truth, and she waited for him. He vanquished his enemies, became the king, and came to be worshipped as a lord of the universe. She waited for him. Krishna’s youth was thus spent among the Gopis who loved Him more than their lives. But soon Kamsa sent Akrura to fetch Him. It was time for Krishna to fulfill His greater mission of getting rid of Kamsa. He made the trip to Mathura city with His brother Balarama. The citizens of Mathura were mesmerized by the two handsome brothers from Brindavan. They all came out see them. Krishna got Himself some new clothes to wear from the king’s clothier. A hunchback lady named Kubja offered Him some perfumes and lotions that she was taking to the palace. In return, Krishna straightened her up by pulling her up by the shoulders. 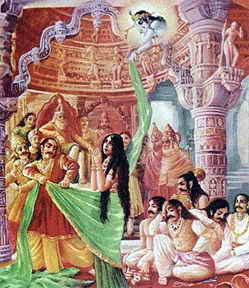 Kubja was very grateful and asked Krishna to accept her invitation to her house. Krishna promised to see her after He had finished His mission in Mathura . When they arrived at Kamsa’s palace, the brothers were attacked by an elephant named Kuvalaya. Krishna killed the elephant very easily. Then an asura wrestler named Chanoora was ordered by Kamsa to attack Krishna . In the ensuing fight, Krishna killed Chanoora very easily. 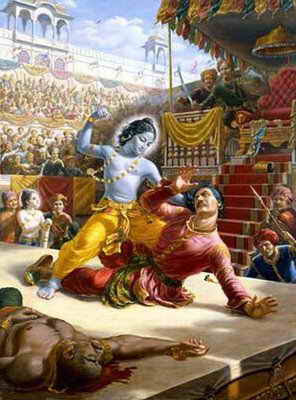 Infuriated, Kamsa himself now attacked Krishna . They fought a very ferocious battle but in the end Krishna killed Kamsa. Bheeshmaka, the king of Vidarbha had two children, Prince Rukmi and Princess Rukmini. Bheeshmaka had heard many stories of Krishna 's valor and secretly wished him to be his son-in-law. He knew that it might not be possible as Kamsa's father in law, Jarasandha, was their overlord and he was Krishna 's sworn enemy. Rukmini had heard stories of Krishna 's valour from her childhood and she had her heart set on marrying him. When she heard that Rukmi had chosen Shishupala for her, she resolved that she would only marry Krishna or die. She sent for her trusted aid Sunanda, a wise old Brahman. She wrote a note to Krishna telling him that he was the only husband for her and asked if he would come and take her away. She wrote to him, that if he wouldn't have her, she would give up her life. She also begged him that he spare the lives of her family whilst kidnapping her. She wrote that on the day of the wedding, she would go to the temple of the Goddess Parvati (their family deity) and if he would, that was the right time to kidnap her. She sent Sunanda with the note to Dwarka ( Krishna 's new fortress home). Krishna had heard a lot about Rukmini's beauty too. He longed to have her but wasn't sure if he should approach her family, as they owed their allegiance to Jarasandha. Upon receiving the message from her, he resolved to kidnap her. Now Jarasandha who knew that Krishna might try something like that to humiliate him, filled Vidarbha with people loyal to him. Jarasandha was furious. 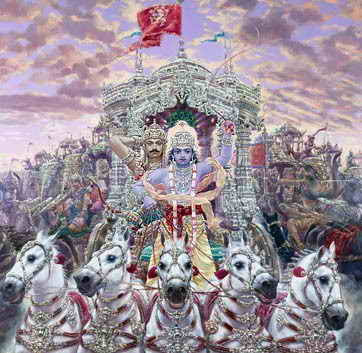 He rallied all his men and ordered them to chase Krishna . Jarasandha's men followed Krishna but were ambushed by Balrama and his army on the outskirts of the city. Now Rukmi managed to go through Balrama's army and catch up with Krishna and Rukmini. He swore that he would not return to his city without his sister. Rukmi fired an arrow at Krishna, but it did not even make a dent in Krishna 's divine armour. 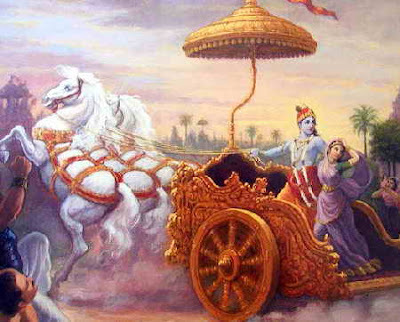 Krishna then fired multiple arrows, which first killed Rukmi's horses and then shattered his chariot. 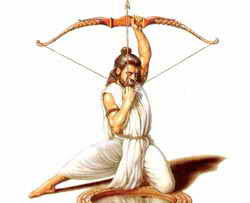 Rukmi then picked up his bow again, but before he could fire, Krishna shot another arrow and shattered Rukmi's bow. Rukmi now mad with rage picked up his sword and ran towards Krishna . Krishna fired another arrow and split Rukmi's sword in two. Krishna then picked up his sword and was about to attack Rukmi when Rukmini begged her lord to spare her brother's life. On Rukmini's saying, Krishna spared Rukmi's life but cut half the hair on his head and half the moustache on his face, the worst insult a warrior could face, and then let him go. Krishna returned to Dwarka with Rukmini and made her his bride. Krishna, in order to remove the stain on his reputation, set out in search of the jewel and found it in Jambavan's cave, with his child. Jambavan attacked Krishna thinking him to be an intruder who had come to take away the jewel. They fought each other for 28 days, when Jambavan, his whole body terribly weakened from the hammering of Krishna 's fists, finally recognised Him as Rama and surrendered. Indra was helpless as he watched Naraka's minions plunder the heavens. 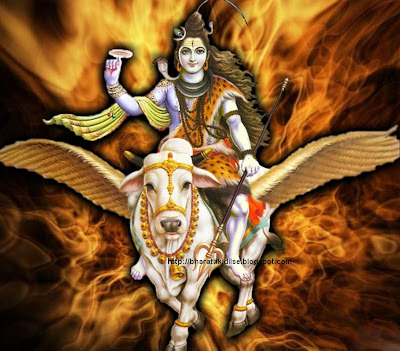 Naraka himself began pursuit of the devas. While pursuing the devas, a glimmering object far away caught his eye. Upon inspection, he realised that the glimmering object was mother Aditi's (the mother of the devas) earrings. He assaulted mother Aditi and grabbed her earrings. Indra reached Krishna's palace when Krishna was spending quality time with his wife Satyabhama. He told Krishna about the happenings and begged him for his help. Krishna was enraged that Naraka might lay his hands on mother Aditi and said that Naraka must die for his insolence. Krishna summoned his mount Garuda (a giant eagle) and made way towards Naraka's fortress. An impenetrable barrier of magic mountains surrounded Naraka's fortress. The mountains were such that a barrier would come up from any side that Krishna tried to enter the fortress. 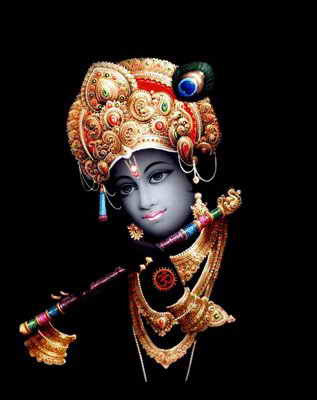 Krishna , unperturbed, hurled his mace at the barrier and shattered the entire mountain range in one blow. A downpour of magical weapons rained down on them. Krishna fired multiple arrows and destroyed all the weapons. In this manner Krishna destroyed countless other magical barriers and finally reached Naraka's fortress. Naraka's palace was guarded by the five-headed demon Mura. Mura hurled countless weapons at Krishna, but Krishna shot each one down with his bow and arrow. Then Krishna picked up his flying discus and hurled it towards Mura dislocating Mura's five heads. Mura fell to the ground, dead. Krishna challenged Naraka to battle and killed him easily. Bhoomi Devi then sang hymns in praise of Krishna and begged him to take Naraka's son Bhagdatta under his protection. Krishna placed Bhagdatta on the throne and then freed all of Naraka's prisoners. The devas showered Krishna with flowers from the heavens. Krishna's and Satyabhama's victory on Narakasura translated into freedom for all his prisoners and honoring of Aditi. Having rescued the 16,100 women, Krishna married them to restore them to their former dignity. Satyabhama, another queen of Krishna, prides herself about the love Krishna has for her and her grasp over his heart. Rukm ini, on the other hand is a devoted wife, humble in her service of her Lord. Her devotion is her real inner beauty. On one contrived occasion, the sage Narada arrived in Dwaraka and in the course of conversation hinted to Satyabhama that the love that Krishna exhibits towards her is not all that real and in fact it is Rukmini who has real control over his heart. Unable to bear this, Satyabhama challenges Narada to prove it. Narada, with his way with words, tricked her into accepting a Vrata (ritual) where she has to give Krishna away in charity to Narada and reclaim him by giving the weight of Krishna in wealth. 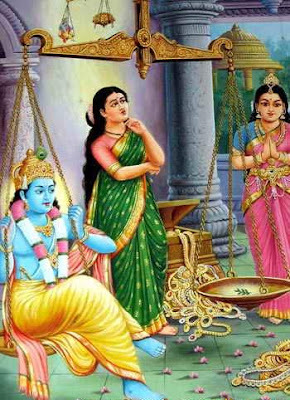 Narada lures her into accepting this vrata by telling her that Krishna ’s love to her will increase many folds if she succeeds in performing this Tulabharam. He also instigates her ego by hinting that her wealth may not be sufficient to equal the weight of Krishna . With Satyabhama's ego duly raised, she tells Narada that she can mobilize so much wealth that it is a child’s play for her to outweigh Krishna . Narada warns her that if she is not able to do this, Krishna will become his slave to be done with as he pleases. Sudama was a poor brahmin boy who became a close friend of Krishna in sage Sandipani's hermitage. Krishna learnt to chant from Sudama. Once, Sandipani's wife asked Sudama and Kr ishna to get some wood from the forest. While they were collecting the wood, a storm came and they got lost. Sudama was scared. Krishna held his arms and assured his safety. When the storm was over, they found their way to the hermitage. Sudama was relieved. 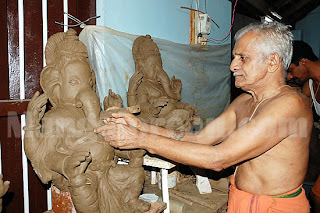 Sandipani blessed them with a long life and happiness. Then Sudma's wife gave birth to two children. Because of Sudama's austere life style, the family began to face difficult days, with little food to eat and no clothes to wear. Sudama's wife was extremely devoted to her husband but when her children began to suffer, she was concerned. Finally on a cold night, when her children were without blanket, she approached Sudama and humbly said, "Aren't you and Krishna , the lord of Dwarika, friends? And, Krishna married to the goddess of prosperity, Rukmini?" Sudama's wife dreamed of seeing an improvement in her family's poor condition. She earnestly said, "Go my lord, I beseech you, for the sake of our dear children, meet Krishna ." The very prospect of meeting Krishna , his old friend, made Sudama happy. "I will go and see him, but I will not ask him for anything." Sudama's wife could hardly conceal her joy. She happily said, "Even a visit to Krishna will bless our family. Do not ask anything from him. I will be content my lord." Just before his departure for Dwarka, Sudama came to his wife. Both had the same thought. "What will I give to Krishna when I see him after such a long time?" Sudama's wife suddenly remembered, "My lord you used to tell me that Krishna immensely loved Powa, the flattened rice!" Sudama too remembered Krishna 's great liking for Powa. Sudama's wife ran to her neighbor's house and they happily gave her the gift of Powa in a small bundle. Sudama then set out on his long journey to Dwarka. When Sudama came to the palace, surprisingly enough, no one stopped him. He looked through various rooms and finally located Krishna and Rukmini. When Krishna saw Sudama he ran to embrace him. 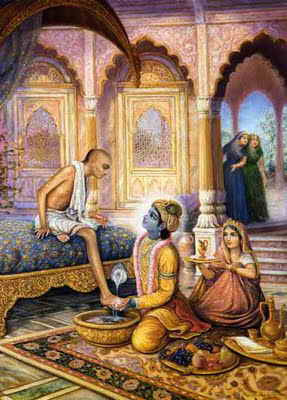 Then Krishna sat down and washed Sudama's tired feet with warm water and put sandalwood paste on them. After the royal meal, they all settled down to chat. Krishna and Sudama exchanged the happenings of their lives since they departed from Sandipani's hermitage. Suddenly Krishna noticed a small bundle on Sudama's waist. He remarked, "Ah! You have brought a present for me!" 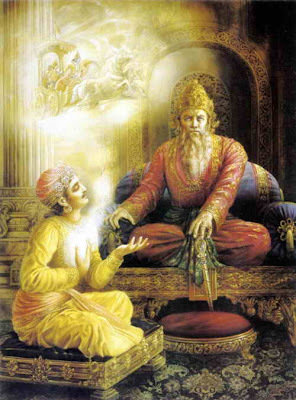 Sudama hesitated, "How do I give a king, a poor man's Powa?" When Krishna noticed that Sudama was ashamed to give him the bundle, he remarked, "Sudama, the poorest gifts given to me with love is dearer to me than the richest of gifts given without love." Krishna was thoughtful, "He has not come to ask anything for himself. He came out of love for his wife and me." Then he quickly snatched off the bundle and opened it. There it was, his favorite Powa! He tossed some in his mouth with great satisfaction. Then they talked and talked, as old friends, to their heart's content. Sudama could not ask anything from Krishna . In the time of Krishna , the blind King Dhritarastra headed the lunar dynasty in Hastinapur. Dhritrashtra and Pandu are the sons of Shantanu. Dhritarastra's wife, Queen Gandhari, had one hundred sons called the Kauravas, the oldest of whom was Duryodhana who along with his uncle Shakuni. Also in the royal palace were Grandfather Bhisma, the king's uncle, and Queen Kunti and her five sons. Kunti's late husband, Pandu, was King Dhritarastra's brother. Krishna was also Kunti's nephew, because her brother, Vasudeva, was Krishna 's father. She grew up away from her family, in the palace of Kuntibhoja , her cousin. When she was a child, Kunti had pleased the powerful sage Durvasa Muni, who gave her a mantra that would allow her to conceive five sons from the demigods. She tested the mantra and the Sun God gave her Karna, whom she secretly set afloat in a river. Karna grew up to become a great warrior for the Kauravas. At this time Grandfather Bhisma enrolled the Pandava and Kaurava brothers in archery training under the renowned archer, Drona. At the end of their lessons, Arjuna ranked first place in Drona's tests, and this was another factor to incite jealousy in the Kauravas. As a final request to his students (guru-dakshine), Drona asked them to arrest a neighboring king, Drupada, and bring him there for justice. The Kauravas failed, but Arjuna succeeded, increasing the Pandava's status. However, that was nothing compared to the trouble that starts when the Pandavas demand their kingdom back from their uncle. On the occasion of a solar eclipse, all the royal families traveled to Kurukshetra to observe religious rites. When the royal families met their relations in Kurukshetra, there were great exchanges of love. At this meeting, Vasudeva and Kunti, who were brother and sister, lamented their long separation. Kunti complained about all she had been through due to Duryodhana. Vasudeva reminded her that he loved her and would have been there to help, except that his life was also miserable due to Kamsa's persecutions. Now in an emotional appeal to the elders present in the forum, Draupadi repeatedly questions the legality of the right of Yudhishthir to place her at stake when he himself had lost his freedom and as a consequence did not possess any property in the first place. Everybody remain dumbfounded. Bhishma, the patriarch of the Kuru family and a formidable warrior has only this lame explanation to offer to Draupadi - “The course of morality is subtle and even the illustrious wise in this world fail to always understand it”. Before the battle, Arjuna, seeing himself facing great-uncle Bhishma and his teacher Drona on the other side, has doubts about the battle and he fails to lift his Gandiva bow. Arjuna fears that acting out his own dharma as warrior will conflict with universal dharma: how can killing family members be good, and not disrupt the social order? Herein lies an unresolved conflict in Hinduism between universal dharma and svadharma (an individual's duty according to caste and station in life). A warrior must kill to fulfill his duty, whereas a brahmin must avoid harming any living creature. Even demons have their own castes and svadharma, which may run counter to human morality. One person's dharma may be another's sin. After eighteen days, the war was over. All the great heroes of the Kaurava dynasty, along with millions of soldiers, lay dead on the battlefield. Only the Panda vas and a small handful of others remained. 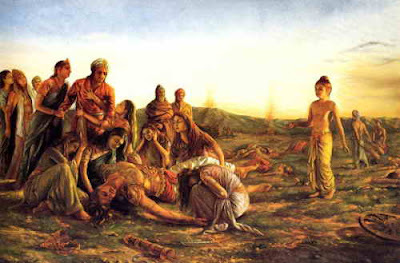 Asvatthama, one of the remaining warriors, killed Draupadi's children in their sleep, hoping to end the royal lineage. Even though Prince Duryodhana wanted to find some last revenge, he was appalled by this atrocity and died of grief. The Pandavas arrested Asvatthama and brought him before Droupadi, but out of compassion she pleaded for his life. The shameless Asvatthama made one more attempt to kill the remaining heir, an unborn grandson in the womb of Uttara, Arjuna's wife. He hurled a brahmastra (nuclear) weapon at Uttara, and when she saw the missile coming toward her, she ran to Krishna for protection. Krishna , who was preparing to leave for His own kingdom, defeated the missile with his Sudarshan-chakra. The child Pariksit grew up to inherit the kingdom. When Gandhari came to Kurukshetr a and saw the corpses of her sons scattered on the battlefield, she blamed Krishna for everything. She cursed Him that in thirty-six years He would also lose everything and die, so that the women in His family would cry, just as she was crying. Then King Dhritarastra, Gandhari, Kunti and their gurus Vidura and Sanjaya left for the forest. The Pandavas lived in grief due to separation from their relatives. After six years, Yudhistira saw his mother in a dream and they all went to the forest to see her. They took Vyasa, a sage and grandfather in the family, with them. Gandhari and Kunti told Vyasa they wanted to see their dead relatives. Vyasa advised them to dip into the Ganges , which they did, and when they came out they saw Karna, Duryodhana and all the others standing on the bank of the river. Even the blind king Dhritarastra saw the vision. After the Pandavas returned to Hastinapura, two days later a forest fire killed Dhritarastra, Kunti and Gandhari. Along with the curse of Gandhari, another curse befell Krishna 's dynasty that contributed to its annihilation. Once some of Krishna 's sons were playing around and they dressed Samba as a pregnant woman, and brought him before some visiting sages Visvamitra, Kanva and Narada Muni. In jest they asked the sages to predict what kind of child Samba would give birth to. Insulted, the sages said he would give birth to an iron rod that would become the instrument to fulfill the prophecy of their dynasty's demise. Fearful and repentant, the boys asked Krishna what to do, but Krishna acknowledged the curse and said it was meant to be. When Samba delivered an iron rod the next day, the Yadavas ( Krishna 's sons) filed it into powder and threw it into the sea. Krishna enforced a prohibition on liquor in Dvaraka, hoping to avoid what was destined to come. Still evil omens began: rats multiplied and attacked humans in their sleep, sheep howled like jackals, asses were born from cows, and cats from mules. Krishna 's Sudarshan-chakra weapon disappeared into the sky. Eventually the powder from the iron rod washed up on the shore and grew into arrow-like grass. The Yadavas became drunk and used the rods to kill each other. Even Krishna beat people out of anger. In this fratricidal war all the descendents of Krishna killed each other. Krishna sent His messenger Daruka to Hastinapura to inform Arjuna of the demise of the Yadava race, then consoled the women in the palace. He told his wives that Arjuna would take care of them and left for the forest. Krishna 's brother Balarama sat down under a tree and his life air came out of his mouth like a white serpent and entered the sea. Krishna roamed the forest for some time, then sat down to meditate. When a hunter named Jara came by, he mistook Krishna for a deer and shot an arrow into His foot. Krishna died at once and his spirit rose into heaven. Arjuna cremated Krishna and several of His principle queens died in the funeral pyre after Him. Arjuna left for Hastinapura with the remaining wives, but on the way, forest dwellers attacked and the women dove into the Satasvati River and died to escape.